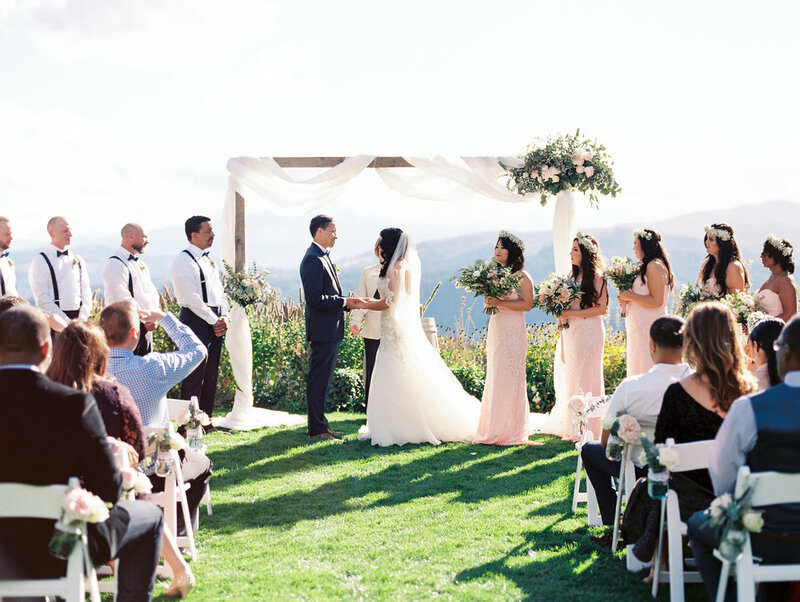 Nailing down the specific ceremony time for you wedding can be a headache. What are you actually supposed to consider when planning the time? Do you just choose one that looks good? What I commonly see happen is couples will plan their ceremony around a traditional "dinner time", or they'll plan it early so they can spend the rest of the night partying. While neither is necessarily wrong, if it's those gorgeous portraits you're after, you might be headed down the wrong path already! Why? Well, as we all know "Golden Hour" is the best time to shoot those soft gorgeous portraits, right? But why? Because the lighting doesn't cause those harsh shadow and it's not as blinding to look towards the direction of the sun! So then why are ceremonies being planned for 3pm in the summer when the light is going to be right on your face? With the extended amount of sunlight we have in the summer, I would recommend you take advantage of that and schedule your ceremony as close to sunset as you can get without interfering with other important photographed events (portraits, cake cutting, speeches, etc). And to make this easier on YOU, I've created an exact list of what times these would be for the summer months here in Oregon! You can check those out below. What you'll see is that these ceremony times are about two-and-a-half hours from sunset. Although you'll have less sunlight after the ceremony, you will have likely missed the opportunity to be blinded while giving your vows! I think that's not a bad compromise. And as a final note on choosing these ceremony times, ultimately where you are standing will make the biggest difference. If you're indoors, you probably won't have to worry about these specific times. If you're in an open field, it's incredibly important to take notes here! If at any point you are able to find shade, no matter how close or far you are from the sunset, it will benefit your images overall. That said, if the shade is spotty, or if your guests are only half covered, these times again will come in handy. When should you take your engagement photos?